Your digestive system is part of your body. So it makes sense that what you do, what you eat, and how active you are will be reflected in your digestive system health as well as your overall health. Being mindful of your diet and striving to keep fitness an integral part of your daily life goes a long way in keeping you continent. There is a saying that 80% of the results in the gym take place in the kitchen. Same thought could be applied to your continence. What you eat and drink, how much, and even when you consume can dramatically impact incontinence. 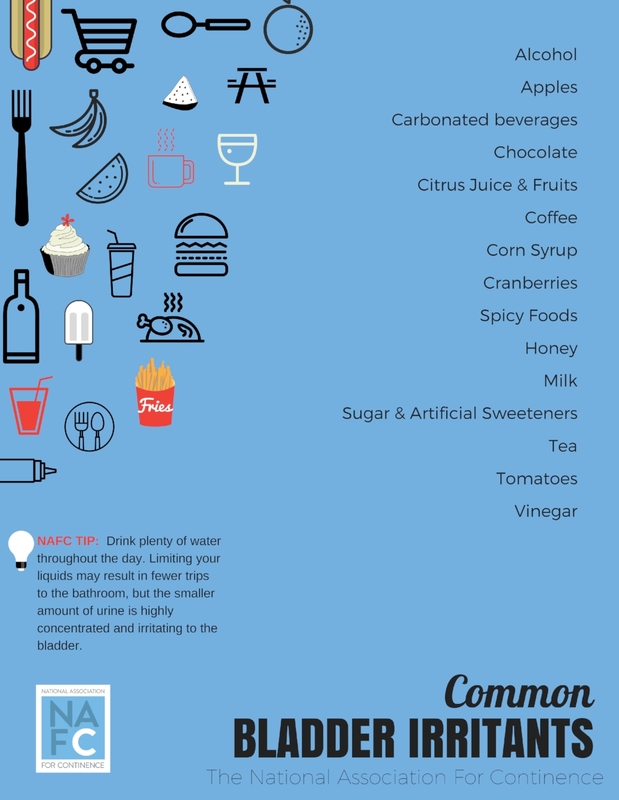 Download our handy list of common bladder irritants and pay attention to your symptoms when consuming these foods and drinks - eliminating them may to reduce your episodes of incontinence. While there is no “diet” to cure incontinence, what you consume can have a profound effect on your voiding patterns. There are symptoms you may be able to manage simply by altering your diet. You may want to complete a bladder diary and monitor your food and fluid intake to see if you are able to find any relationship between your intake and urination. Remember that certain “natural” or “energy” supplements may also contain ingredients that irritate the bladder, so read labels carefully. Limiting water fluid intake may actually increase the incident of incontinence. Many people who have bladder control problems reduce the amount of liquids in the hope that they will need to urinate less often. Unfortunately, this creates more problems. First, with less liquid, the urine may be more highly concentrated. This in turn irritates the bladder surface, causing you to go to the bathroom more. Reducing fluid intake can also encourage growth of bacteria which triggers incontinence. You’ve heard it a million times, but there is a reason that individuals are recommended to drink a total of 6 to 8 glasses (8 oz. each) of fluid throughout the day. Unless under the advice of your physician, never restrict fluids to control incontinence. It is understandable to focus solely on the muscles and organs of the body that control digestive health. Yet, developing an exercise program that engages the entire body will be beneficial for overall health. A well-rounded exercise program includes strength training for improvement of the muscle system, endurance training for enhancement of the cardiovascular system, balance exercises, a flexibility routine to promote mobility, and pelvic floor muscle exercies to reduce or eliminate incontinent episodes. Sounds like a lot of work doesn't it? Let's break it down. Strength is the ability of our muscles to generate force for everyday tasks. The ability to lift yourself out of a chair or climb a flight of stairs is dependent on the strength of your legs. Muscle strength peaks when we are in our twenties and thirties. By age 50 the majority of us will start to lose muscle fiber and by age 80, we will have lost up to 50% of the muscle fiber in our arms and legs. Although size of muscle is not directly related to strength, strength of muscle does decline with age. Studies prove that exercise can slow the gradual loss of strength. Strength training can be free weights, resistance bands, weight machines, weighted balls, or even one's own body weight. It is generally recommended to strength train every other day, allowing worked muscles recovery time. Research reports that even people in their eighties can gain strength with just 8 weeks of resistance training. Want to control your weight? Strength training can help control weight by improving metabolism. Muscle burns calories. It can also improve bone health as the resistance on the muscle places a healthy stress on the bones to keep bones strong. Muscle strengthening of the pelvic floor can decrease or even eliminate incontinent episodes. Pelvic floor muscle exercises are often recommended as the first line of defense for stress urinary incontinence for both women and men. The United States guidelines for physical activity recommend strength training for active and older adults on two or more days per week for all muscle groups. Endurance exercise generally refers to aerobic activity. It is any exercise that causes the heart and breathing rate to increase. Walking briskly is considered a moderate intensity workout. For the person who is inactive, starting with just 10 minutes is considered beneficial. Walking, jogging, swimming, or cycling for 30 minutes per day (2 hours and 30 minutes per week) at a moderate intensity is the United States guideline for substantial health benefits. You can lower your blood pressure, risk of heart disease, risk of stroke, and even your risk of breast and colon cancer with physical activity. Most of us are working on a balance activity every time we engage in a walking program. For those with a history of falls, specific balance exercises are best. A balance assessment by a qualified physical therapist will determine where to begin a balance program, be it sitting, standing, stationary, or mobile. Flexibility is especially important as we age. The range of movement of the spinal joints reduces with age and makes us feel stiff. Muscles and tendons lose elasticity making it harder for joints to move. Muscle stretching exercises are recommended on two or more days per week for many people. Most people forget about this part of an exercise regime. Although studies are not conclusive on the benefits, it is thought to help prevent injury and improve joint mobility. It is easy to build your flexibility exercise into your "cool down" from your aerobic activity. Overweight women have a greater risk of being incontinent than women with an ideal body weight. The good news is, studies have shown that significantly overweight women with incontinence who lose excess weight can actually reduce episodes of unwanted urine loss. One study demonstrated that obese women who exercised and lost about 10% of their body weight reduced their leakage by half and maintained these results for six months. To improve continence, consistent moderate exercise each week is recommended. It shouldn’t surprise anyone that the health impact from smoking is far reaching and can create incontinence. Individuals with Stress Urinary Incontinence who also smoke may have more trouble with leakage because of recurrent, downward pressure on the bladder each time they cough. Yet another great reason to quit smoking.